CAALC is generously supported in a great part by the volunteers who donate their time each week to work with adult students on reading, comprehension, practical skill training, and subject-specific tutoring. These volunteers cannot perform their important work without the quality resources they need to educate students. CAALC uses a variety of resources to teach adult students to read, and the basis of the curriculum is ProLiteracy's Core Reading system. Most students begin with the Laubach Way to Reading series, which takes a person from letters to 4th grade reading. Depending on the student's goals after completing the Laubach Way to Reading series, they can move on to the Challenger or Endeavor series. The entire program will provide a student with reading skills up to the 8th grade level, commonly referred to as functional literacy. CAALC also provides GED and HSET tutoring to adult students to give them the power to reach personal and career goals. CAALC can start a student on the way to reading at a 1st grade level for only $30. An adult student can finish the entire Laubach Way to Reading Series for $120. 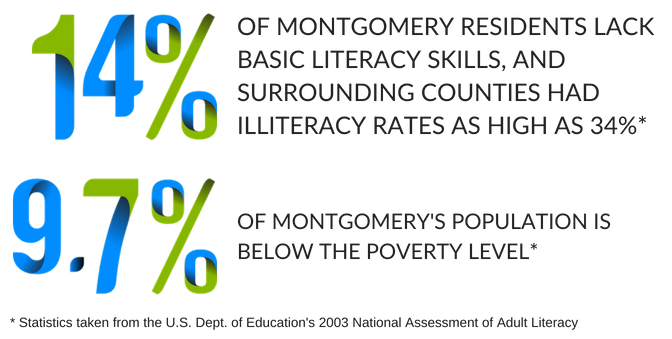 Providing functional literacy to an illiterate student can be accomplished for $250. For the remarkable donation of $375, an adult student can go from illiterate to acquiring his/her GED. CAALC can do a lot with a little of your support through a donation. Giving the gift of literacy to an adult learner not only improves his/her own life but also the workforce, the community, and the next generation of learners.